Community volunteers honor students for their dedication to improving individual reading fluency through one-on-one support. On Wednesday, May 23, the Boys & Girls Club of Greenwich hosted an End-of-the-Year Celebration for its Reading Champions. The Greenwich United Way’s Reading Champions program, in partnership with the Greenwich Public Schools, is a literacy program pairing Greenwich youth with trained community volunteers in an effort to build fluency skills during the school year. This year, 43 students at the Boys & Girls Club of Greenwich after-school program were honored for their accomplishments. During the event, Greenwich United Way CEO, David Rabin; Reading Champions Co-founder, Joan Lowe; and Boys & Girls Club Executive Director, Bobby Walker; Reading Champions Program Ambassador, Kaitlin DeBellis were in attendance to say a few words. Prior to writing ‘Choosing Hope’ and founding Classes 4 Classes, DeBellis spent her days with first graders helping them to become readers. “I still spend my summers doing so. I know the joy that reading brings to children and the sparkle they get in their eye when they’ve moved on to a new reading level. It is pure magic. The work that Reading Champions is doing here in Greenwich is invaluable. Reading Champions is bringing that magic to hundreds of children. I can’t think of anything more important. I loved what Joan Lowe said to me when we first met, in describing what she says to her students when she first meets them: Joan tells them: ‘you are good at reading now, I’m going to make you a champion’. She then described the look on the child’s face: ‘joy’. These students are champions, they are determined to be the best readers that they can be, and Reading Champions empowers that desire and drive,” said DeBellis. She concluded, “In the words of Vince Lombardi; ‘The difference between a successful person is not a lack of strength, nor a lack of knowledge, but a lack of will’. These students have the will and Reading Champions has given them a way to succeed”. This year marks the 10th anniversary of the Reading Champions program. The Greenwich United Way has supported this critical reading fluency program for over ten years by raising funds, recruiting volunteers and working with community agencies. 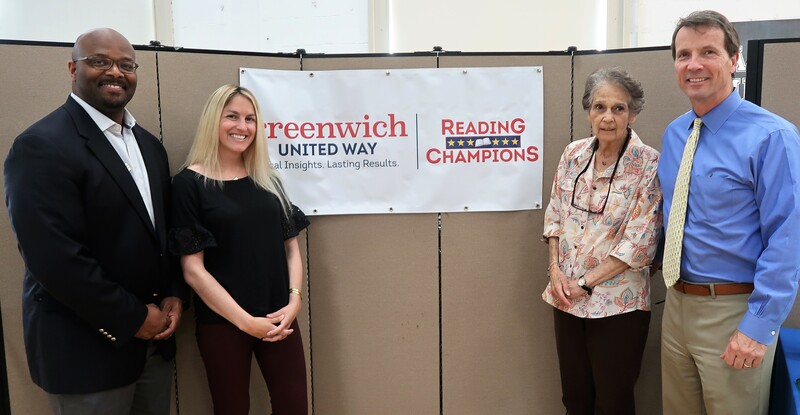 Each year the Greenwich United Way organizes a series of private events, at each program location, to honor both volunteers and students participating in the Reading Champions program. Some celebrations are open to the student’s immediate family members and are a heartwarming experience for attendees. The Boys & Girls Club of Greenwich is a Greenwich United Way agency partner and separately receives a grant through the Greenwich United Way Community Investment Process. Reading Champions is part of the Greenwich United Way Champions Programs. These programs are designed to give students the extra one-on-one support they need to improve academically. Champions Programs are powered by trained volunteers that are organized and led by the Greenwich United Way. Finance Champions is currently in a pilot stage with help from teens who volunteer with the Greenwich Junior United Way. To become a trained volunteer, for more information, or to make a donation, please contact Cecile Meunier through email (cmeunier@greenwichunitedway.org) or visit Greenwich United Way online (greenwichunitedway.org). Kaitlin M. Roig-DeBellis is the Founder & Executive Director of Classes 4 Classes, Inc., a 501(c)3 organization. Classes 4 Classes is a social networking tool, for every student in the United States to learn: compassion, caring, kindness, empathy, consideration, through active engagement. Kaitlin travels all over the world speaking to School Boards, Administrators, Teachers, Students, Non-Profit organizations, Corporations, and Conferences as a keynote and commencement speaker. Kaitlin is the author of ‘Choosing Hope: Moving Forward From Life’s Darkest Hours’ published by G.P. Putnam & Penguin. In January 2016, Kaitlin will be teaching 2 undergraduate Education courses at Bay Path University as an Adjunct Professor. Kaitlin serves on the NEAG Alumni Association Board of Directors. Kaitlin writes educational blog posts for the Huffington Post weekly. In May 2016 Kaitlin received the Ellis Island Medal of Honor for her work with Classes 4 Classes. In October 2014, Kaitlin received the alumni association’s Humanitarian Award from her alma mater, The University of Connecticut. In May 2014, Kaitlin received two Honorary Doctorates, one of Humane Letters from Bay Path College and the other of Public Service from Luzerne College. Kaitlin delivered a TED x talk at UMass Amherst in April 2014. Kaitlin contributed to the book ‘Teaching From the Heart’ volume 2, published in May 2014. In 2013 Kaitlin was honored as one of Glamour Magazine’s Women of the Year alongside Nobel Prize nominee Malala Yousafzai, Congresswoman and shooting survivor Gabby Giffords, and Emmy nominated actress Kerry Washington, among others. In June 2013 Kaitlin received the Dedicated Teacher Award from The Chicago International Conference on Education. Also in 2013, Kaitlin was honored by L’Oreal Paris one of their “L’Oreal Paris Women of Worth” of which she was one of “10 Inspiring Women Making Beautiful Differences in their Communities. Kaitlin attended UCONN and was accepted to the NEAG School of Education, where she completed her Masters of Education with honors in 2006. She was a member of Order of Omega honor society, The Historical honor society, and the NEAG honor society, and was named a New England Scholar in 2005.